What is the difference between 47 turns ratio and 45 turns ratio? The 47 turns would produce 4.7 V.
This is the voltage in the secondary circuit of the transformer. By changing the turns ratio we were able to change the voltage output of the transformer. Some transformers have tap switches built in. These tap leads connect to various points in the primary coil. This allows you to change the turns ratio of a transformer which gives you a multitude of voltages from one transformer. See Article: WHAT IS THE LOWEST TRANSFORMER TAP? What is the lowest transformer tap? The universal answer to this question is the number 1 tap. The deeper question is what does this represent? Transformers vary in design so the number 1 tap can also vary by design. What does not vary is that the lowest tap connects the primary to the maximum number of turns in the transformer. This will produce the lowest voltage available from the transformer. This low voltage will in turn drive lower currents and welding power. All other tap settings will produce more voltage and power being delivered to the resistance welder. Calculate the duty cycle at 50%. With the duty cycle calculated, use step 2 to calculate the actual power required to operate at the 50% duty cycle. Then compare the values to determine if the 70KVA transformer is sufficient for the job. KVA demand is a measure of the actual instantaneous demand for power placed on the electrical delivery system of the plant during the weld cycle. 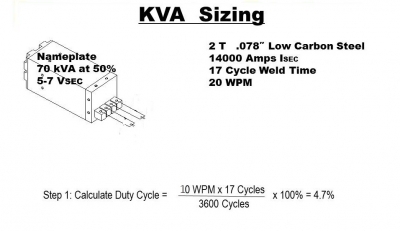 The KVA Demand in turn is used to calculate the KVA rating at 50% duty cycle. Transformers are commonly rated at 50% duty cycle. Below is an example of a calculation of KVA demand for an application using a 70 KVA AC transformer to determine if it will be adequate? Why did the resistance welding transformer short out between the primary and secondary coils? Resistance welding transformers are very robust. They can operate for years without any problems. When they fail it is catastrophic. A short between the primary and secondary coils is one method of failure. This occurs when the insulation between these coils fails. 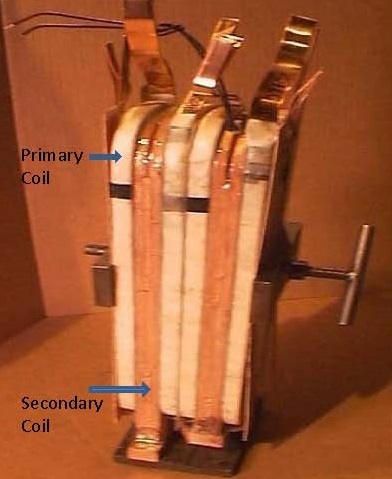 It is a very thin separation between the primary and secondary coils. Any damage to this thin layer can lead to a catastrophic short between the two coils. To prevent this from on the replacement transformer the cause for the short must be sought and a plan to prevent in the future put into place.